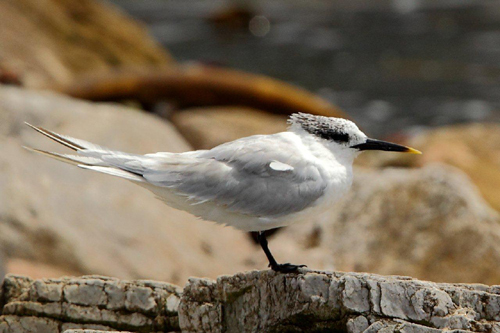 Sandwich Terns visit our coast from October to April every summer. They migrate from Western Europe and the UK along the West coast of Africa. Some only go as far as Angola or Namibia but about 10 000 – 15 000 (about 5% of the European population) carry on to the South African coast and some of them follow the coast all the way to Mozambique. 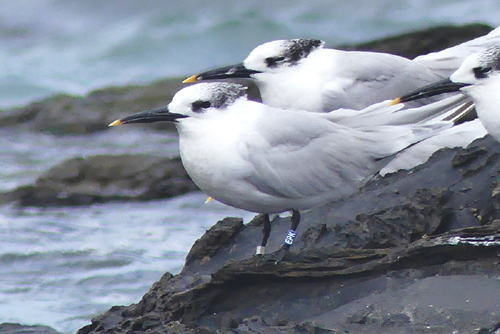 Sandwich Terns have been ringed in Western Europe and the UK for over 100 years. The problem with data collection has always been that the rings could only be read when dead birds were found or birds were caught. 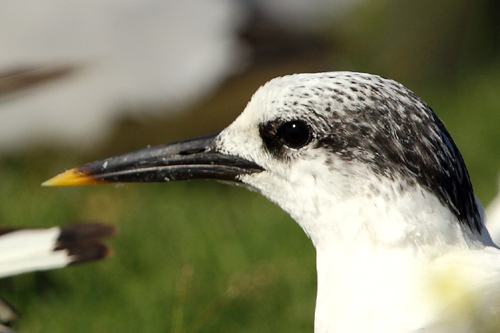 Over the last number of years field-readable rings have been introduced for larger birds such as terns and gulls. These innovations have made it fairly easy to read a ring without having the bird in hand. The ring consists of coloured plastic material with a 3 digit alpha/ numeric code written vertically. A traditional metal ring with additional information is usually attached to the other leg. The coloured rings can be read with a scope, binoculars or from photographs. In some countries such as Germany, Denmark and Poland they also use field-readable metal rings but they are more difficult to read than the colour rings. 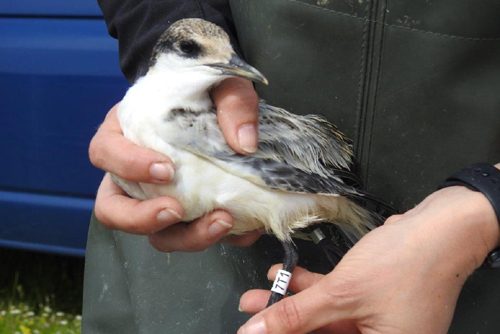 The photo below shows a Sandwich Tern (Blue-EPK) that was ringed on 09-05-2014 at the Ythan Estuary in North East Scotland. It was seen in Ireland in Sept 2014 and visited its natal colony in Scotland again the next year. In February 2017 it was seen here at the Strand and it then went back north where it was seen in Wales in August. It returned to South Africa where I took this photo at the Strand in December 2017. The photo below shows a close-up of a typical ring. 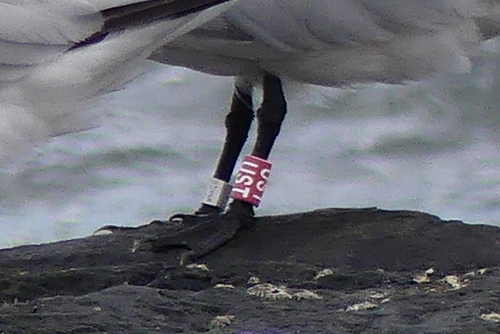 This bird, Red-UST was ringed in the Farne Islands, Northumberland, England in June 2014 as a chick and visited the Strand the last two seasons. The last time I saw it was in early March 2018 when it looked splendid in full breeding plumage. They start breeding at age 3 to 4 and at 3.8 years old this was its first breeding season. During 2017/18, I have photographed and reported some 105 ringed Sandwich Terns, most of them from Gansbaai and the Strand. These include 65 individual birds for which life-records are available and 33 repeat sightings of 19 of these birds. A further 8 cohort ringed birds were reported. These have colour rings but the rings are not engraved with a code so the place and year of ringing is known from the colour combination but not the full life-history of individual birds. The 65 birds with full histories were from the Netherlands (29), Scotland (11), Ireland (8), England (7), Germany (3), Poland (3), Wales (2) and Denmark (1). I report all my sightings by email, with photos attached, directly to the group/person that was responsible for ringing the specific bird. The responses have been fantastic. It would appear that despite the fact that these field-readable rings have been in use for over 5 years, very few sightings have been reported from South Africa. In four cases my reports were ‘firsts’ for the ringing group with the bird being their first ever to be reported from South Africa. Even when it is not a first, a report from South Africa always generates excitement as it is the furthest country from Europe that the birds migrate to. One sighting of a bird from Germany in 2017 was reported in several newspapers in Germany. According to the Institut fűr Vogelforschung “Vogelwarte Helgoland” this bird has been seen the furthest away of all birds ringed in Lower Saxony since 1909. I have since then reported two more Sandwich Terns that were ringed at the same place (the small island of Baltrum in the Frisian Islands). Some of the ringers sent me ‘baby photos’ of the birds I reported. Below is a typical one of Sandwich Tern White-7T1 taken on the day it was ringed on the island of Texel in the Netherlands. This bird was seen in its second year at Gansbaai in January and February 2018. During our summer months Sandwich Terns can usually be found amongst the Common and Swift Terns and gulls that make up the mixed flocks all along our coast. The trick is to find a roosting area which is easily accessible and where you can approach the birds sufficiently close to be able to read the rings. At some locations it is important to get your timing, in relation to the tides, right. My favourite spots are Gansbaai Harbour, Strand and Hermanus (Gearing’s Point). Although the rings can be read with a scope or binoculars I recommend the use of a camera. The latest generation of ‘super zoom bridge’ cameras are ideal for this. Despite their relatively modest price, they have great zoom capability, fast and accurate autofocus, good image stabilization for handheld shots and have a nice size and weight for handling in the field. A list of bird ringing groups/individuals in Europe and the UK that are active in ringing Sandwich Terns with the codes they use can be found at www.crbirding.org/taxonomy/term/2166. If you do not have photos but could read the code on the ring, report the code and colour of the ring. The ringing groups usually respond very quickly by sending you the life history of the bird that has been reported. Please also report all sightings to Tony Tree (tony@zeane.digital) who handles the southern/eastern Africa tern database. If you don’t know who to report a sighting to you can send it to Tony or to me and we can assist you. There is still a lot to be learned about the migration of Sandwich Terns and the field-readable rings have now made it possible for all of us to make a contribution to building up a large database on the birds that visit our shores. In birding terms, finding a ringed bird may not be quite the same as seeing a lifer but I nevertheless find it a very exciting and rewarding activity. If you need assistance with the reporting of sightings or have any questions, feel free to contact me. The last two images by Carin Malan of BirdLife Overberg.